So I’m trying to finish up this Astronomical League observing club. Not the Galileo Club, although I am persevering with tracking Jupiter’s moons and all the rest. 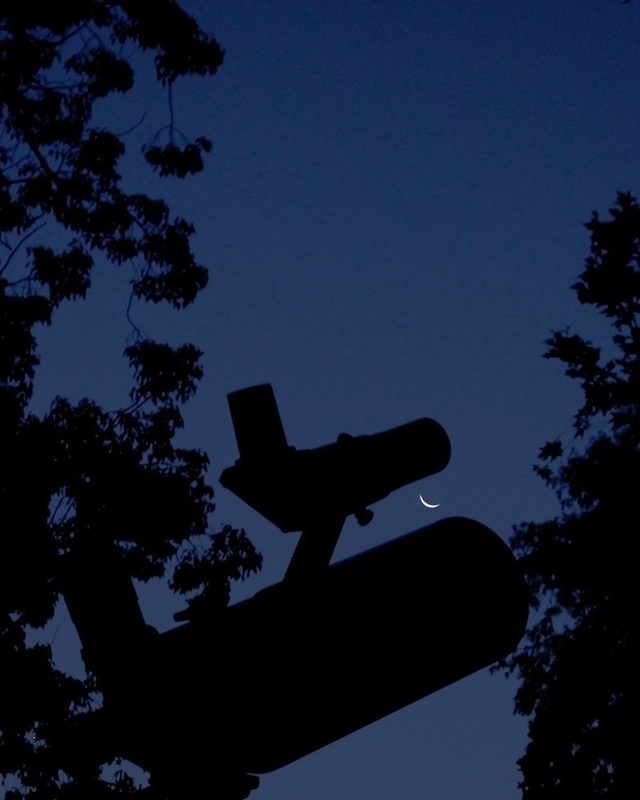 No, I’m talking about the Lunar Club, a list of 100 targets for the naked eye, binoculars, and telescopes. I’ve been chipping away at it off and on for over a year, and I’ve been stuck on the last three targets for months. Ironically, it’s not tiny detailed features that are holding me up, but naked-eye views of the whole disk. The clincher isn’t size or distance, but time. Specifically, get-out-of-bed time. My last few targets are views of very thin crescent moons, mostly waning crescent moons that are only briefly visible before sunrise. I’m a night-owl, not a morning person. If I’m up at 5:00 AM, it’s usually because I stayed up, not because I got up. But this morning I dragged my carcass out of bed at that unholy hour to go out and see “the new moon in the old moon’s arms”. That enchanting term refers to the faint illumination of the moon’s disk lit by Earthlight, between the much brighter horns” of the crescent that are still lit directly by sunlight. You’ll recall that near new moon, the moon is between the Earth and sun, and the far side is almost fully illuminated and the near side is almost fully in shadow. At one time or another you probably have seen a young crescent moon low in the western sky at sunset, with the entire disk visible. That’s the flip side, after new moon, “the old moon in the new moon’s arms”. The photo on the right side of my banner is a one-second exposure of this phenomenon, taken with my Nikon Coolpix 4500 and 6-inch reflector. It’s really striking how many features you can make out on the shadowed disk by the faint reflected Earthlight, especially with a telescope. There’s also one about seeing the old moon in the new moon’s arms within 72 hours of new, but you can see that any month without really trying so I knocked it off ages ago. New moon is Monday at 11:14 AM PST, so the 72 hour window opened yesterday at 11:14 AM. This morning I saw the new moon in the old moon’s arms. Tomorrow morning–assuming I get out of bed and there aren’t any clouds–I will hopefully see the waning crescent within 48 hours of new. Then Tuesday evening I’ll have a chance to catch the waxing crescent within 40 hours of new, and thus complete the requirements for the Lunar Club. You are currently browsing the 10 Minute Astronomy blog archives for the day Saturday, November 14th, 2009.